This Saturday, Covenant Christian Academy celebrated “An Evening of Gratitude”, commemorating 20 years of God’s faithfulness. About 200 attendees gathered together at Messiah College, including Covenant’s faculty, staff, students, board, parents and supporters. 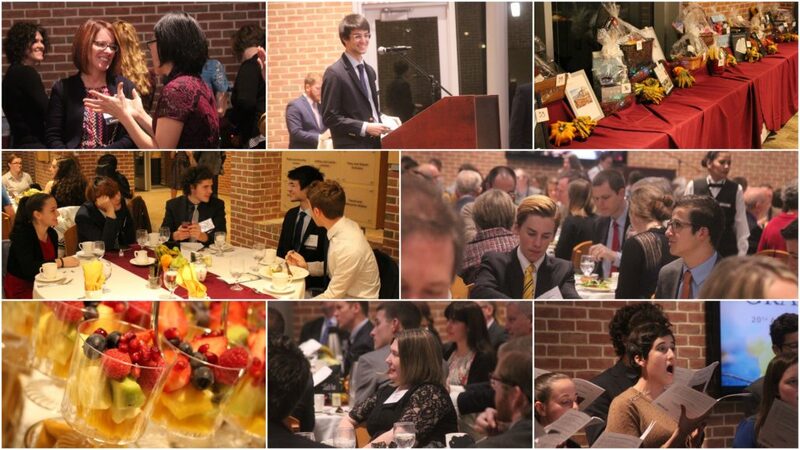 The group enjoyed fellowship, good food, a silent auction, slideshows of years past, celebration of the school’s history, and speeches from the founding headmaster, a current Upper School student, an alumna, and the keynote speaker: Hon. Paul J. McNulty, President of Grove City College. Dr. Sonju, Covenant’s head of school, set the tone for the evening, by welcoming everyone to enjoy a wonderful night of fellowship together in celebration of 20 years of God’s faithfulness at Covenant. Dr. Dean Curry, Dean of the Honors College at Messiah College, then offered a welcome on behalf of Messiah College since the event was hosted in the beautiful Martin Commons on Messiah’s campus. Dr. Curry praised Covenant graduates who have “enriched the academic and co-curricular culture of Messiah College in innumerable and meaningful ways”, including six Covenant alumni who currently attend there. Following a delicious main course, Mr. Jesse Mauer led Covenant’s Chamber choir in blessing the audience through song. They sang a choral arrangement of the traditional hymn, “Abide with Me”, an evening hymn fitting for the occasion. Dr. Sonju pointed out that several of the choir singers were members of our Covenant Volleyball team who earlier that day had played in a state quarterfinals match. Since a classical education aims to form students in the fullness of their humanity, it is fitting to hear a choir made up of athletes and scholars. Our first speaker was Covenant’s first headmaster, Dr. Christopher Perrin, who stole the show with hilarious stories from the early years, remarking that it was like “riding a tiger…we were taking chances everywhere…we were trying to learn as we moved along.” Classical education was something they were trying to recover and renew, providing an education to their children that they hadn’t received themselves. “Education” he said, “used to be the cultivation of a soul, on truth, goodness and beauty, by reading the great books, by means of the liberal arts, under the Lordship of Christ.” As Covenant developed as a school, “we were reading things about what education used to be and then trying to bring it to life at Covenant Christian Academy in Harrisburg, Pennsylvania.” Dr. Perrin also praised Covenant for its close community, warm and welcoming atmosphere and relational integrity; all of which it has maintained as a small school. He called upon those in attendance to strengthen the wobbly bridge back to classical education that he and the early founders of Covenant began slowly to forge. Lucas Lanza (class of 2018) shared that his love and desire for fellowship is one of the greatest gifts being part of the Covenant community has given him. He sees fellowship as a time “when believers come together and share their walks with Christ, what they are grateful for, and their struggles.” He has been able to think about his life and faith with depth, in accordance with the Word. Erin Burlew (class of 2010) shared her gratitude for the education she received at Covenant. Ms. Burlew shared that Covenant taught her to think and speak well which has served her well in her career as a CPA. She quipped that although her profession is not typically associated with eloquence and confidence, she argued that her Covenant education has given her confidence to argue her points with clients –a task that can require much courage when disagreeing with a senior financial executive on a particular point. She is also grateful for how her classical, Christian education has given her discernment to evaluate and choose a new church and community upon moving to Richmond.